A ladybug and ant move at constant speeds. The diagrams with tick marks show their positions at different times. Each tick mark represents 1 centimeter. Lines $u$ and $v$ also show the positions of the two bugs. 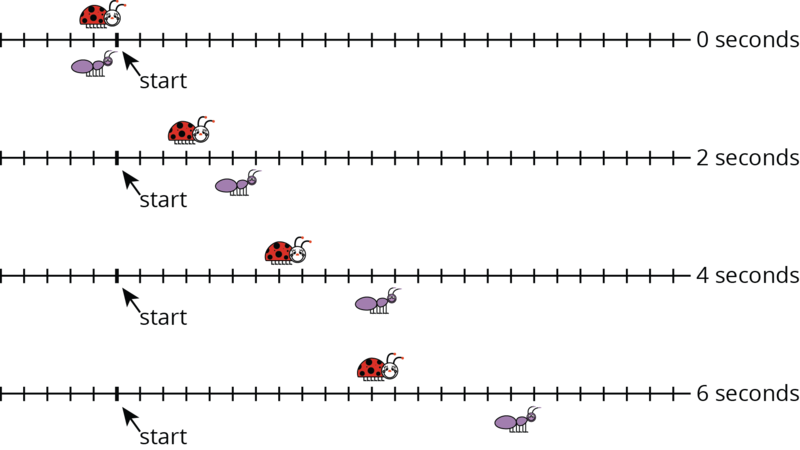 Which line shows the ladybug’s movement? Which line shows the ant’s movement? Explain your reasoning. How long does it take the ladybug to travel 12 cm? The ant? 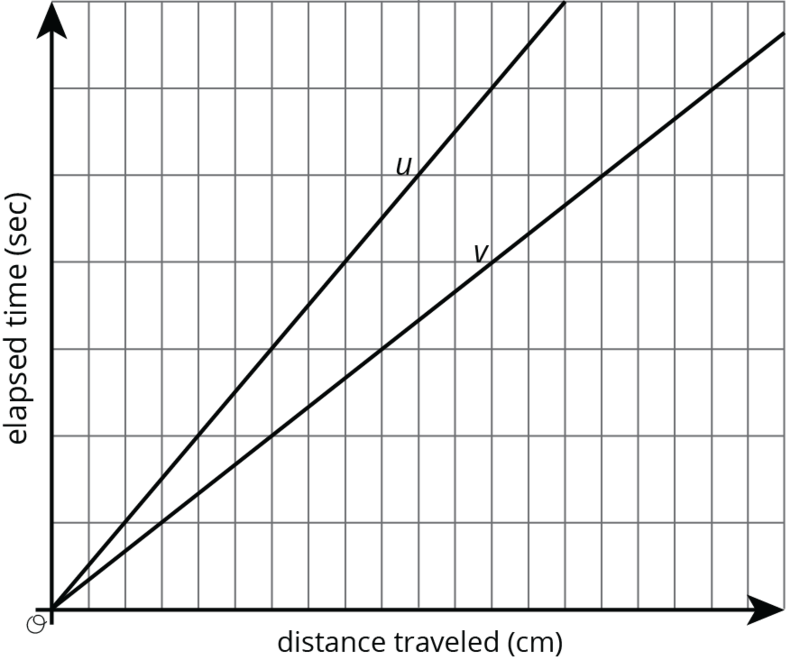 Scale the vertical and horizontal axes by labeling each grid line with a number. You will need to use the time and distance information shown in the tick-mark diagrams. 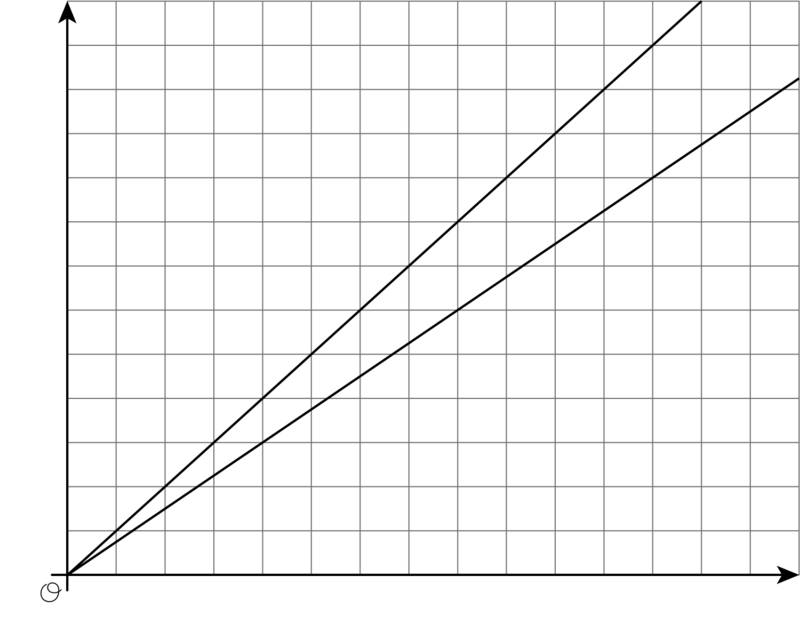 Mark and label the point on line $u$ and the point on line $v$ that represent the time and position of each bug after travelling 1 cm. How fast is each bug traveling? Will there ever be a time when the purple bug (ant) is twice as far away from the start as the red bug (ladybug)? Explain or show your reasoning. Refer to the tick-mark diagrams and graph in the earlier activity when needed. Imagine a bug that is moving twice as fast as the ladybug. On each tick-mark diagram, mark the position of this bug. 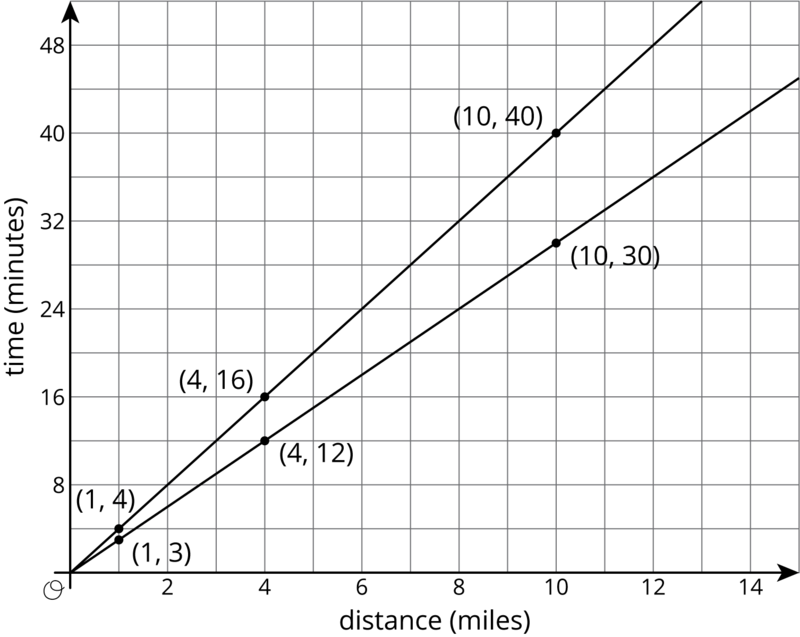 Plot this bug’s positions on the coordinate axes with lines $u$ and $v$, and connect them with a line. Write an equation for each of the three lines. Which graph goes with which rider? If Kiran and Mai start a bike trip at the same time, how far are they after 24 minutes? How long will it take each of them to reach the end of the 12 mile bike path? Who rides faster? Mai rides faster because she can ride the same distance as Kiran in a shorter time. If Kiran and Mai start a bike trip at the same time, how far are they after 20 minutes? The points on the graphs at height 20 are 5 miles for Kiran and a little less than 7 miles for Mai.